Journey to the Cross cross shaped bookmark with rustic nail keepsake as a reminder of Jesus' sacrifice. 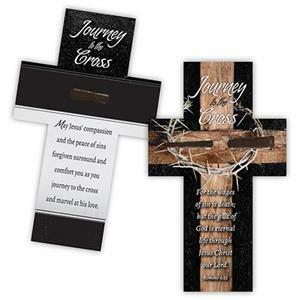 Bookmark features Bible verse from Romans 6:23, For the wages of sin is death; but the gift of God is eternal life through Jesus Christ our Lord. Give away during Easter church services or other event. Bookmark is 3" x 5"; nail is 1.5" long.